Patidar Anamat Andolan Samiti (PAAS) leader Hardik Patel has subtly changed his pitch for the second phase of polling in the Gujarat Assembly elections. He appears to have put the demand for quotas for the Patidar community on the backburner. Instead, he is focussing on unemployment and agrarian distress, issues that would help him tap a broader audience. To get a sense of Patel's change in strategy, take a look at his Twitter timeline. Patel has a habit of listing out the issues he focussed on at a particular rally or event. The last time tweeted the words Anamat or Arakshan, the two terms used for reservation, was on December 7, the last day of campaigning for the first phase of polling. Since then, he has listed several other issues as the main focus of his rallies. On 8 December he addressed a rally in Dholka in Ahmedabad in which he targetted the BJP government for "firing on Dalit and Patidar youth". December 9, he addressed a rally for mobilising farmers in Karjan in Vadodara. December 10: In his rally in Mahisagar district, he focussed on agrarian distress and the pain of farmers who have to leave their land and migrate to big cities. In his rally in Siddhpur in Patan district on the same day, he stressed repeatedly on equality between various communities and the need for unite all caste groups to fight for their rights. .
December 10, he also held a show of strength on the border of Mehsana district as he is not allowed to enter the district. On December 11, he organised a 'Yuva Kranti' roadshow targetting the youth. Compare this to his rallies before 7 December. He stressed on reservation for Patidars in his rallies in Amreli on 6 December, Jasdan and Jetpur in Rajkot district on 4 December, Surat in 3 December, Dhari in Amreli on 2 December, Visavadar in Junagadh on 30 November, Tankara and Khakhrechi in Morbi and Rajkot city on 29 November and Patdi in Surendranagar on 26 November. This is not to suggest that Patel hasn't spoken about reservations after 7 December or that he didn't speak about farmers and unemployment before that. But it does seem clear that he has pushed the quota for Patidars on the backburner in the run-up to the second phase of polling on 14 December. The reason for this is the different demographic profile of the areas that went to the polls in the first phase on 9 December and those that go to vote in the second phase. In North and Central Gujarat, Patidars and Thakors are present in almost equal numbers. While Patidars have overwhelmingly voted for BJP in the past, Thakors have tended to tilt towards the Congress. So with the Congress and PAAS forging an alliance this time, the party had to be extra careful not to alienate its Thakor supporters. Had Hardik overplayed the reservation card, it could have alienated Thakor voters. Thakors already fall under the OBC category and so the Patidar demand for OBC status in 2015, had provoked a counter mobilisation of OBCs led by Alpesh Thakor. In the second phase, the Congress is heavily relying on support form both OBC and Patidar votes. In Patan district, all the Congress candidates are Thakors. Alpesh Thakor himself is contesting from the Radhanpur seat in the district. On the other hand, the party is playing the Patidar card in all the constituencies in Mehsana district except in Becharaji where it has fielded a Thakor and Kadi which is reserved for Scheduled Castes. The same strategy is being used in Kheda district in Central Gujarat as well as semi-rural seats like Viramgam in Ahmedabad district. A PAAS functionary revealed that given the dominance of Kadva Patels in North Gujarat, the outfit is far more confident of consolidating Patidar votes in this region compared to Phase 1 areas like Saurashtra and Surat, where Leuva Patels are also present in substantial numbers. 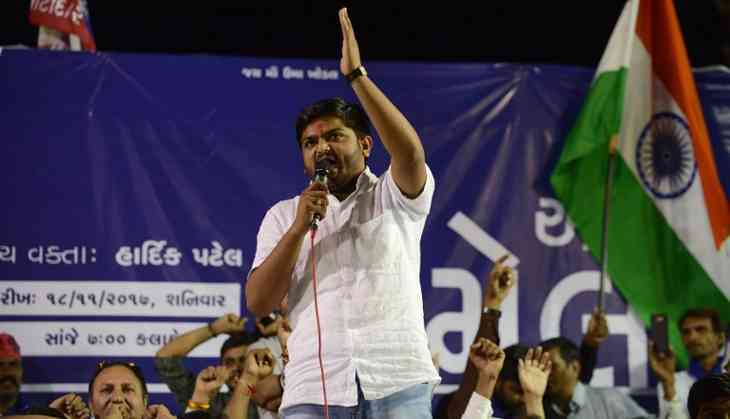 Hardik Patel's popularity is higher among Kadva Patels who are comparatively poorer and comprised a majority of the protestors in the 2015 Patidar agitation. In comparison to North Gujarat, the Congress has been less successful in winning over OBCs in Saurashtra. The ABP-CSDS survey in the end of November revealed that BJP has a 16% lead over the Congress among the OBC Koli-Patel community, that is numerically strong throughout Saurashtra. The change in Patel's strategy is the product of deliberations within PAAS as well as interactions with the Congress. "Our victory doesn't lie in merely ensuring the transfer of Patidar votes to the Congress. What purpose will it serve if the party doesn't win?" said a PAAS strategist who didn't want to be named. "Our victory lies in defeating the BJP," he said dramatically. He said that it was felt that PAAS should do whatever it takes to defeat the BJP, even if it meant downplaying the quota issue. "We stand by the quota demand. But we won't take anyone else's share. Also we realised that this election is about much more than just this," he said. Hardik Patel on his part also realises that the way the campaign has progressed, he is no longer seen just as a leader who is demanding a quota. "Farmers are angry irrespective of which caste they belong to. The government's apathy has affected every community in rural areas. Unemployment exists in every community," Patel says in his rallies. If the Congress manages to keep both OBCs and Patels in its fold, it could end up sweeping much of North Gujarat, as has been predicted in at least one pre-poll survey.